Our traffic to this site has been phenomenal!Thank you all you curious wanna-be knitters and Netflix watchers! My son was a little upset with me last night. I wanted to change the yarn I was using because I was getting frustrated with the rib stitches I was doing. I pulled out a ball of blue yarn and started another scarf. My son walked in, saw me and got this sad look on his face. I forgot that I bought him this yarn for his finger knitting projects. Hundreds of dollars on Christmas gifts, a trip to Disneyland and Xbox games, it’s the ball of cheap yarn he’s upset about! He’s just like me. 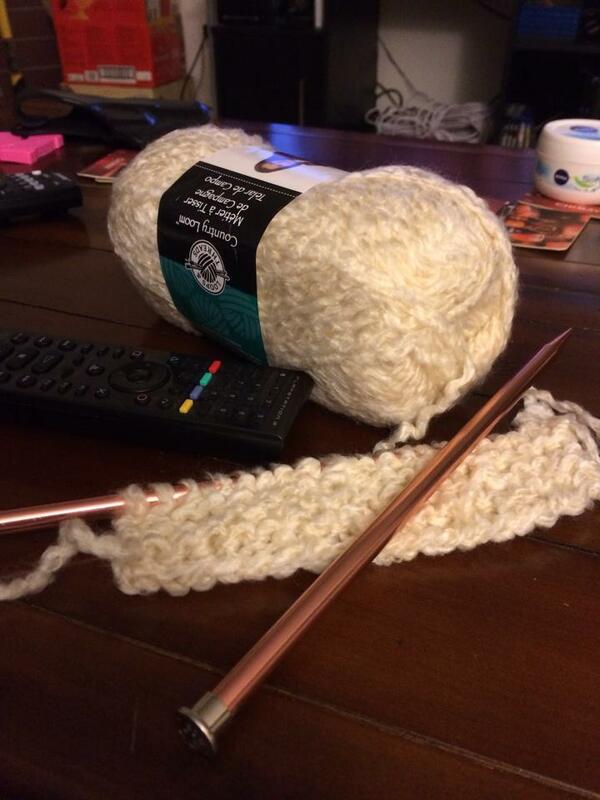 Listen, learning to knit is easy! Basically you’re making a knot on a needle and transferring it to another one. But hey, it took me a little while to even figure that out. The good news is, is that this site is more than just knitting, and more than just watching Netflix. Whether you prefer one over the other, or something else entirely, we may have you covered. So head on up to the top of this page, or wherever the “follow” button is and click it. This is going to be fun! Welcome Knitters, Netflix watchers, or both! We’re just a group of knitters watching Netflix streams. We sometimes do one or the other, or both. I’m such a beginner, that I can’t do both right now, but I can listen. If I try to do both, I end up forgetting if I did a knit stitch or a purl stitch. I have ripped apart many scarves because of this inability to concentrate. And having two children who seem to want to talk over each other, invade my space at its quietest, and bicker with each other doesn’t really help either. Ah well, I’ll get them back when I knit them socks as a Christmas present next year.